Breast cancer is probably the greatest fear women have, even though they are 10 times more likely to die from heart disease. 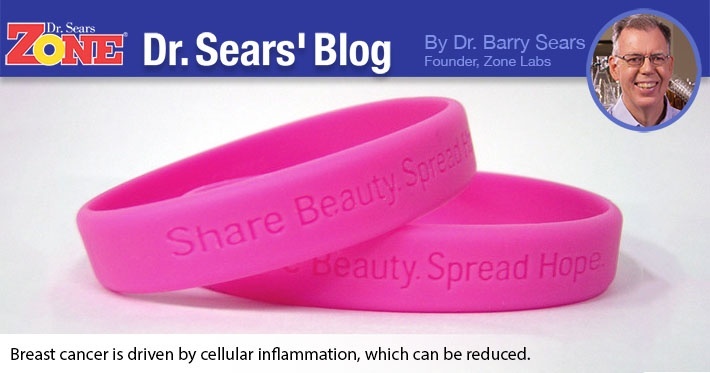 Yet both diseases are driven by cellular inflammation. Cellular inflammation occurs when the most primitive part of your immune system (the innate immune system) is activated. The key player in the innate immune system is a gene transcription protein known as nuclear factor-kappaB (NF-κB). Once activated, NF-κB moves into the cell's nucleus and causes the expression of a wide variety of pro-inflammatory mediators that accelerate the growth of the tumor. A recent publication in Cancer Research has demonstrated that complete inhibition of the NF-κB in the breast tissue prevents the development of breast cancer in animal models (1). Of course, there is one slight problem with this approach. If you inhibit NF-κB too much, you make yourself a sitting target for microbial invasion. So the question is what activates the NF-κB in the first place? The answer is the diet, and specifically how the diet increases the levels of arachidonic acid, as I described in my most recent book, “Toxic Fat” (2). As the levels of arachidonic acid increase in the cell, there is an increased formation of inflammatory compounds (i.e. leukotrienes) that activate NF-κB (3). So what might the best approach be for reducing the risk of breast cancer? The obvious answer is to decrease the levels of arachidonic acid in the breast tissue. The best way would be to follow a strict anti inflammatory diet to reduce the formation of arachidonic acid in the first place (4). Unfortunately, most women (and men) are not willing to take that step. That being the case, then what other dietary approach can be used? I would suggest that supplementing the diet with high-purity omega-3 fatty acid concentrates rich in EPA and DHA is the one approach that everyone can follow. This is especially true since it takes only 15 seconds a day. The benefits of this approach was recently demonstrated in another article published last year in the American Journal of Clinical Nutrition that demonstrated supplementation with purified omega-3 concentrates can dramatically increase the levels of omega-3 fatty acids in the breast tissue of women who have a high-risk potential of developing breast cancer (5). Of course, if you not only take high-purity omega-3 fatty acid concentrates, but also follow the anti inflammatory diet, then you will have done every possible dietary intervention to reduce the activation of NF-κB in the target tissue for breast cancer (not to mention also reducing the risk for heart disease). Of course, there are some side effects to this dietary approach: You become thinner, smarter and happier in the process. Liu M, Sakamaki T, Casimiro MC, Willmarth NE, Quong AA, Ju X, Ojeifo J, Jiao X, Yeow WS, Katiyar S, Shirley LA, Joyce D, Lisanti MP, Albanese C, and Pestell RG. “The canonical NF-kappaB pathway governs mammary tumorigenesis in transgenic mice and tumor stem cell expansion.” Cancer Res 24: 10464-10473 (2010). Sears B. “Toxic Fat.” Thomas Nelson. Nashville, TN. (2008). Sanchez-Galan E, Gomez-Hernandez A, Vidal C, Martin-Ventura JL, Blanco-Colio LM, Munoz-Garcia B. Ortega L, Egido J, and Tunon J. “Leukotriene B4 enhances the activity of nuclear factor-kappaB pathway through BLT1 and BLT2 receptors in atherosclerosis.” Cardiovasc Res 81: 216-225 (2009). Sears B. “The Zone.” Regan Books. New York, NY (1995). Yee LD, Lester JL, Cole RM, Richardson JR, Hsu JC, Li Y, Lehman A, Belury MA, and Clinton SK. “Omega-3 fatty acid supplements in women at high risk of breast cancer have dose-dependent effects on breast adipose tissue fatty acid composition.” Am J Clin Nutr 91:1185–1194 (2010).